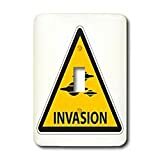 UFO invasion warning sign road attention traffic abduction aliens funny Light Switch Cover is made of durable scratch resistant metal that will not fade, chip or peel. Featuring a high gloss finish, along with matching screws makes this cover the perfect finishing touch. THE REAL LEAKED ALIEN FOOTAGE! WARNING: DISTURBING VIDEO. WARNING THE FOLLOWING FOOTAGE CONTAINS CERTAIN PARTS THAT VIEWERS MAY FIND DISTURBING!